Should there be a limit to diaspora criticism of Israel? Entry 1: Is there a line American Jews shouldn’t cross? 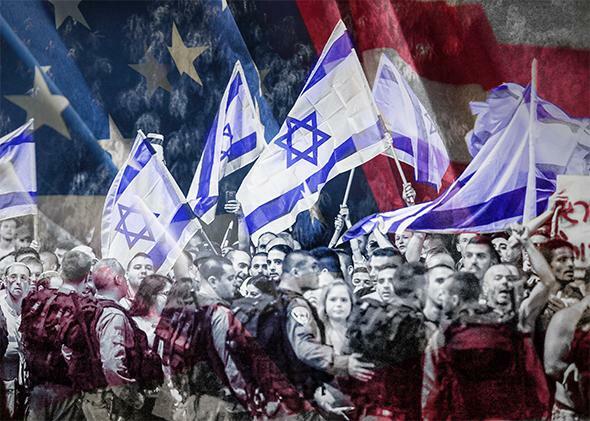 Should American Jews refrain from criticizing Israel until this round of fighting is over? Photo illustration by Slate. Photo by Ammar Awad/Reuters,Thinkstock. That stung me, because I didn’t read the columns that way at all. In his response to Rosner, Chait called his own Zionism “immutable.” Reading him and the others, I assumed that, too. I realize that talking and writing about Israel is like picking one’s way through a minefield, especially in a period of tension and violence, and even more so if you’re Jewish. Still, I saw these pieces as thoughtful if sad entries in a long-running debate over what Zionism means, not whether Jews deserve a homeland. I talked to Rosner on the phone on Sunday, and he told me that he does not believe that being “pro-Israel,” if you live outside it, means falling into line with every position of the Israeli government and the public opinion polls. “Among Israelis, I’m probably considered a lobbyist for listening to American Jews,” he said. So what’s going on here? Are there limits on the kind of dissent non-Israeli Jews should express? I’m not talking about what we can say—it’s our right, obviously, to speak, scream, and yell about whatever we want. But is there a solidarity line that we shouldn’t cross? I wanted to ask you these questions for reasons that begin with the personal. I went to Israel for the first time when I was 11, with my grandparents, who were proud Zionists. I went back at 16, and then again for a summer during college to research my senior thesis. On that third trip, I stayed with your aunt and uncle in their lovely, sunny flat in the Jerusalem neighborhood of Baka. You were half of a pair of adorable 8-year-old twin nieces who lived down the hall. I came back after I graduated, to study and write for a year. Throughout and ever since, your family has been my entry into a deeply thoughtful and compassionate circle of the Israeli left. And now here you are, all grown up, on staff at The New Yorker, and a wonderful writer. Rosner also told me that the Gaza operation “is rare in the level of support it gets from all parts of Zionist Israel, from the right to almost the far left,” and that the almost universal backing inside Israel should say something about the validity of the operation to American liberal Jews. He pointed out that the left-wing Labor and Meretz parties have not come out against the operation. Neither has J Street, a liberal American alternative to the traditional lobby power of AIPAC, the American Israel Public Affairs Committee. Rosner also brought up Amos Oz, the prominent Israeli novelist, as a leftist whose criticism of the Gaza operation has been muted. The weight Rosner ascribed to timing when I talked to him was lost on me when I read his piece, I confess. That’s a revealing missed signal. If I was in Israel, hearing sirens and racing my kids to a bomb shelter, it would have been obvious. Maybe that’s a useful reminder about the limitations of what Jews like me can understand from a distance. I just don’t see this, either on the page or as subtext. What do you think, Ruth? Does the timing matter? Should Jews outside of Israel refrain from criticizing Israel until this round of fighting in Gaza is over? Does it “delegitimize the idea of Israel,” as Rosner put it to me, to focus on its flaws and failings now?